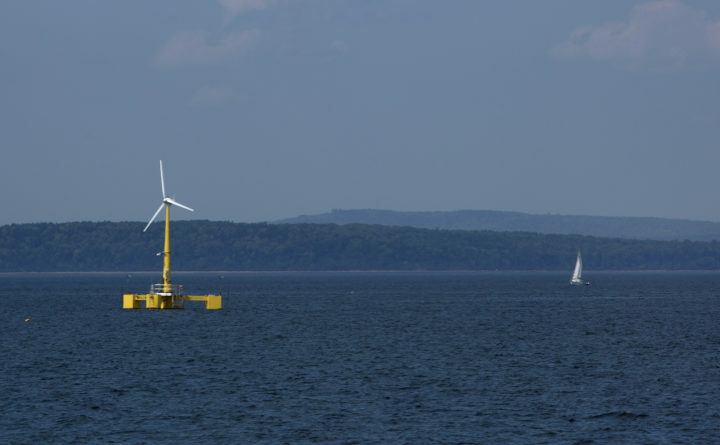 The University of Maine's floating wind turbine, VolturnUS. The 1:8-scale prototype for the huge 6-megawatt turbines is the first grid-connected offshore floating wind turbine in the U.S. The St. George Select Board voted Monday to oppose an offshore wind project taking shape about 12 miles away, standing with local fishermen who say the project and its transmission cable would harm their livelihoods. The unanimous vote follows a recommendation made by an advisory committee created last month by the five-person Select Board to weigh the impact the Maine Aqua Ventus offshore wind project would have on the local community. “I think it’s a good idea we sever ourselves from [Maine Aqua Ventus] and that we support the fishermen in any way we can,” Select Board member Randy Elwell said Monday. Maine Aqua Ventus ― a collaboration between the University of Maine, Cianbro Corp., and Naval Energies ― would bring electricity onshore from two six-megawatt wind turbines that would be installed just off Monhegan Island. The pilot project is designed to test the feasibility of the University of Maine’s floating platform technology. Using an existing charted cableway, Maine Aqua Ventus proposes using an underwater cable to transport the energy ashore in Port Clyde, a small village located at the end of the St. George peninsula. The Department of Marine Resources prohibits fishermen from using mobile gear within charted cableways. However, the cable currently in the charted cableway that Maine Aqua Ventu wants to use has been inactive for decades ― meaning fishing restrictions haven’t been enforced in that area. Fishermen have a host of concerns about the Maine Aqua Ventus project and the prospect of the Gulf of Maine becoming home to commercial wind farms. But the inability of local fishermen to use mobile gear in the charted cableway provided the chief basis for the advisory committee’s negative recommendation. “All you need is one [concern], that if you look at it and say, ‘OK, here is a concern that it doesn’t appear can be addressed, and this creates harm to people in the town.’ And if that’s going to be the case then the town ought to be against it,” said Jerry Hall, a Select Board and advisory committee member. The Select Board urged fishermen and Maine Aqua Ventus representatives to continue working to resolve the fishermen’s concerns. But until that happens, the town will stand against the project. Groups representing fishermen have opposed the project, including the Maine Coast Fishermen’s Association, the Maine Lobstermen’s Association and the Zone D Lobster Council. Maine Aqua Ventus said its representatives are working with state and federal agencies to allow fishing over the cable with both mobile and fixed gear, though the Department of Marine Resources will make the final determination. After Maine Aqua Ventus completes a geophysical survey of the cable route in early 2018, fishermen will have a better idea of how much of the cable can be buried. The St. George Planning Board will take up the matter next, as it works to develop a proposal that would beef up the town’s shoreland zoning and site-review ordinances, Hall said. After the planning board has completed its proposal, the Select Board will review it and bring it to a public hearing for a vote, which Hall said will likely occur in February. But there is little the town can do to prevent the cable from coming ashore in Port Clyde as long as Maine Aqua Ventus follows the local ordinances and permitting process. “I know we can’t prevent this cable, by law, to land on these shores, but I’m hoping we can put enough [ordinances and regulations] in place to deter [the project] until they can come out with something better,”said Randy Cushman, a lifelong Port Clyde resident and fisherman. While Monday’s vote in opposition of the project was merely a sentiment, it won praise from fishermen who have been frustrated with the town’s handling of the project. But with the town taking a formal stance, fishermen believe their efforts have been vindicated, at least on a local level. The Select Board also voted to send letters to Maine’s congressional delegation, urging them to take the concerns of Maine fishermen into consideration when dealing with ocean energy management.